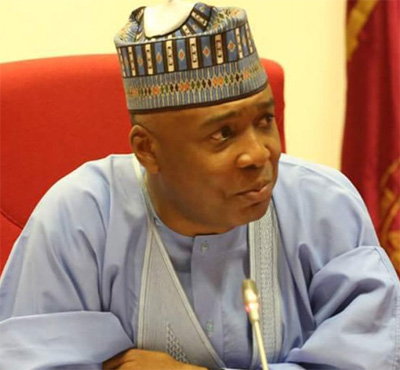 Saraki in a statement yesterday said that he did not mind that the APC leader would continue to bellyache over the issue which he said was prompted by national interest. Responding to assertions made against him at the APC presidential campaign rally in Ilorin, Kwara State on Monday, Saraki in a statement signed by his Special Adviser (Media and Publicity),Yusuph Olaniyonu, stated that the APC leaders know that their party would lose the presidential and National Assembly elections on February 16, 2019 and hence the resort to name calling and avoidance of the issues. “As for Tinubu, we have never expected any good words from him. All his life, he will continue to belly ache and nurse grudges over my opposition to the Muslim-Muslim ticket idea in 2015. As far as he is concerned, I stopped him from realizing his ambition then. However, I believe my action then and now is in pursuit of national interest. Again, I supported President Buhari in 2015 because I believe he could make a positive change. I left the party when I realized he lacked the capacity and the desire to make any change. “Tinubu on his own part said though he agreed with me about my assessment of the man, he would continue to support Buhari even if the man had to govern from the hospital stretcher because that is the way he (Tinubu) could become the President in 2023. So, while my position is premised on national interest, Tinubu’s is based on his personal interest and ambition. Now that Tinubu’s new speciality is to hurl insults at people like former President Olusegun Obasanjo and former Vice President Atiku Abubakar, focusing on me today is okay if it will help him feel good. “It is surprising that a man like Tinubu will be talking about morality and corruption. This is a man whose disrepute is known both within and outside Nigeria. This is somebody who personifies everything that is wrong with the Nigerian system. Well, I am not ready to roll in the gutter with him. Unlike them, I will stay on the issues that are germane to national development and the welfare of our people.